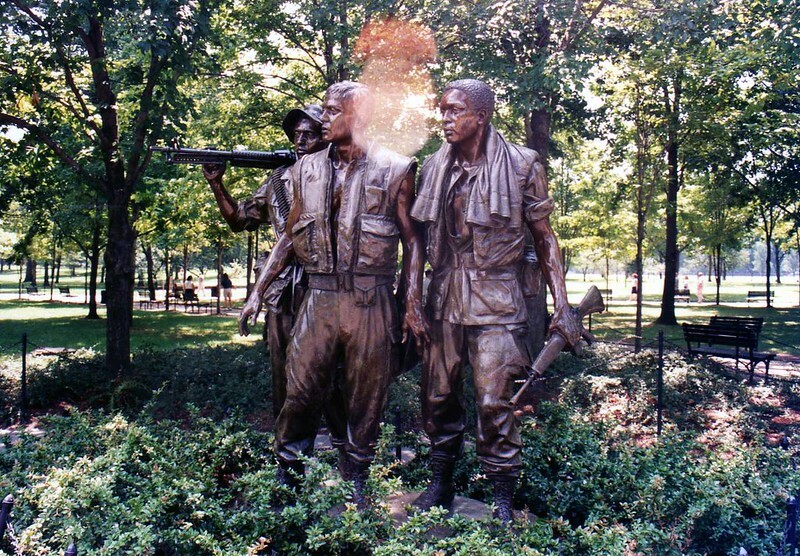 The Three Soldiers (also known as The Three Servicemen) is a bronze statue on the Washington, DC National Mall commemorating the Vietnam War. The grouping consists of three young men, armed and dressed appropriately for the Vietnam War era, purposely identifiable as Caucasian, African American, and Hispanic. It was designed to complement the Vietnam Veterans Memorial, by adding a more traditional component. The statue, unveiled on Veterans Day, 1984, was designed by Frederick Hart, who placed third in the original design competition. Image published by wallygrom on 2010-03-01 22:56:26 and used under Creative Commons license.